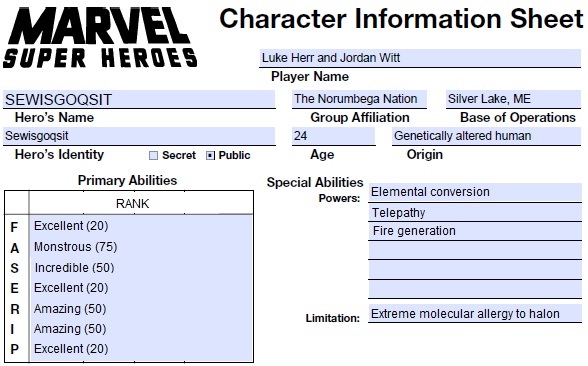 …in which I use the character creation rules in the Marvel Super Heroes RPG’s Ultimate Powers Book to roll up a random batch of powers and abilities, adiposity then sit back and watch as some incredibly talented folks work their creative magic upon the quantified chaos. This week’s radiant contribution was provided by the dynamic duo of Jordan Witt (art) and Luke Herr (writing). Like so many native tribes in North America, the Mi’kmaq people saw a danger coming from the Europeans. Unlike most of their nation though, the Norumbega tribe had a protector – a spaceship that had crash landed off the coast of Maine centuries ago. The Norumbega had prospered as the ship provided what it could, medicine, food and protection, but as the Europeans began to show up, the ship’s AI became increasingly erratic and soon it vanished underground taking the Norumbega tribe with it and leaving a mystery for the explorers and neighboring tribes. There were no clues to what had happened and soon it was written off as a map making error from an inexperienced sailor. In truth, the ship wanted to prepare it’s new people for the invaders and so it granted them unrestricted access to the technology, the genetics and the knowledge stored within itself. The Mi’kmaq learned and grew, mastering technology that would quickly outpace the invaders but as their knowledge grew over the decades, their freedoms was lost and soon the ship had become a totalitarian monster, carefully mapping out family trees and practicing eugenics and bioengineering until the descendants of the tribe rebelled. Sewisgoqsit, whose name means “to break apart with fire”, ripped through the ship turned god turned dictator, breaking it apart atom by atom till her people returned to the sunlight of the world that their ancestors had been stolen from. As the waters from Silver Lake started to pour into the ship, Sewisgoqsit bravely led her people into the brave new world. Though her knowledge of the world was limited to what records the ship had held before, Sewisgoqsit understood that she needed to be a brave leader who would look forward to the future that might be built instead of focusing on the past that had been lost. 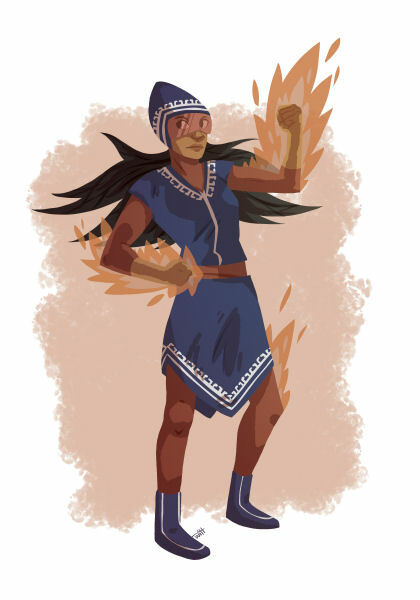 She reached out to the local leaders and was able to secure a new life for the Norumbega and they now serve as heroes of Maine, fighting the elements more than anything, but serving to embody the ideals of compassion towards community that was a pillar of the Mi’kmaq beliefs, though their openness can only stretch so far as a permanent guard has been built over Silver Lake to prevent others from reaching their former home and tyrant. Sewisgoqsit has telekinetic control over fire that can be focused at such a level to use energy to break apart matter into its base elements. While it functions as a type of alchemy, her weakness towards halon, a flame retardant, can threaten her powers and her very life as she is powered by the fire inside herself. As a leader, she stands strong and intelligent, blending compassion towards others with a steely determination to see justice brought for all, though this classic desire may cause issues for her as the tribe adjusts to the brave new world. Are you an artist, writer, or terrifying combination of the two who’d like to try your hand at the Ultimate Powers Jam? Then drop me a line at bitter(dot)andrew(at)gmail(dot)com and I’ll commence the dice to rolling. Eventually. I promise.